September 25, 1999. It was the perfect night for an outdoor Marty Party. The moon was high and full. When we got there, we headed right for the stage. We met Darlene and her husband. We parked our blanket next to their chairs. We were right in front of the stage about 4 rows back. It was a perfect view of Marty. There was a rock band called Big Loo that opened. They were OK, if you like that kind of rock. I like southern rock. Finally, it was time. 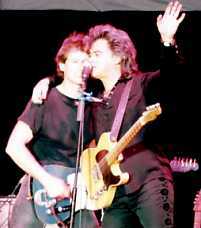 A voice came from the depths and said "MARTY STUART AND THE ROCK AND ROLL COWBOYS"! Yes! The guys all walked out all dressed in black (big surprise). Marty followed them out dressed in the lace-up shirt, black rose embroidered pants and black jacket with white trimming. They all looked sooooo fine. They started with "Brown Eyed Handsome Man." (That is another song that I'd like to hear him record.) He apologized for getting started late, but he had to go to Wal-Mart. Big laugh. He was drinking Mountain Dew and made a comment about it since there was a 20-foot blow-up bottle of Sprite to the right of the stage. (They were a sponsor that night.) Later, he said he sure would like a glass of iced tea. Someone backstage brought him one. 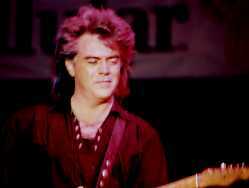 He talked about some of the older singers that are from Texas and jumped into Buddy Holly's "Well All Right," with Gary beating on Gregg's cymbals. Next came the big "WELL! well, well, well," The Whiskey Ain't Workin'," "Blue Train," and "Tempted." He did a lot of talking about traditional country music and started playing "Dark as a Dungeon." Then he stopped and asked Randy to come out. He introduced him and said that Randy had just found out that day that his grandmother had passed away. So, he dedicated "Dark as a Dungeon" to him. He did an awesome job as usual. Next came "Burn Me Down." WOW! The man was hot last night. Fingers were flying on those strings on every song. He sounded so good. With all the hype about the CMAs, he talked some more about where country music came from. He mentioned how he thought Alan Jackson did a good thing. He also said he sent Alan a telegram supporting him. Then he talked about Johnny Cash and sang "Ring of Fire." It was great. I don't think I have ever heard him sing that one. It was really cool. Next he sang some songs from "The Pilgrim." First was "Sometimes The Pleasure's Worth the Pain," "Red, Red, Wine and Cheatin' Songs" and then he talked about trains and wanting to become a hobo, but decided to become a musician instead. LOL! All to soon came "Hillbilly Rock". The crowd was on their feet and cheering. He ended with an instrumental of " Yellow Rose of Texas" (really cool) He came back for an encore. He did an instrumental of "Faded Love" (wonderful). Then he let Gary play "Last Date". He then brought the place down with "Western Girls." Then it was time for the meet and greet. Jodee was there. We talked to her while waiting in line. She has family there and was visiting them. Then the time came to see Marty. He had changed clothes. He looked like he was ready for bed. He was really sweet. My daughter asked him where his purple boots were. He said "on the bus." I thought she was gonna ask him to go get them. He hugged her, signed her pictures and her Onelist shirt that she was wearing. She was gonna leave and he said, "Wait, I wanna hug." So, she got two hugs. Then it was my turn. He signed my photos and Busy Bee Cafe record album. I told him I would see him in Ft. Worth and he said, "OK, that'll be fun." Oh what a night.